After a bit of a slump as far as recipe creativity goes, I'm finally back with a little inspiration. I met a new friend over on Instagram, who reached out to me with an opportunity to try out some of their brand's products inspired by the Mediterranean diet. 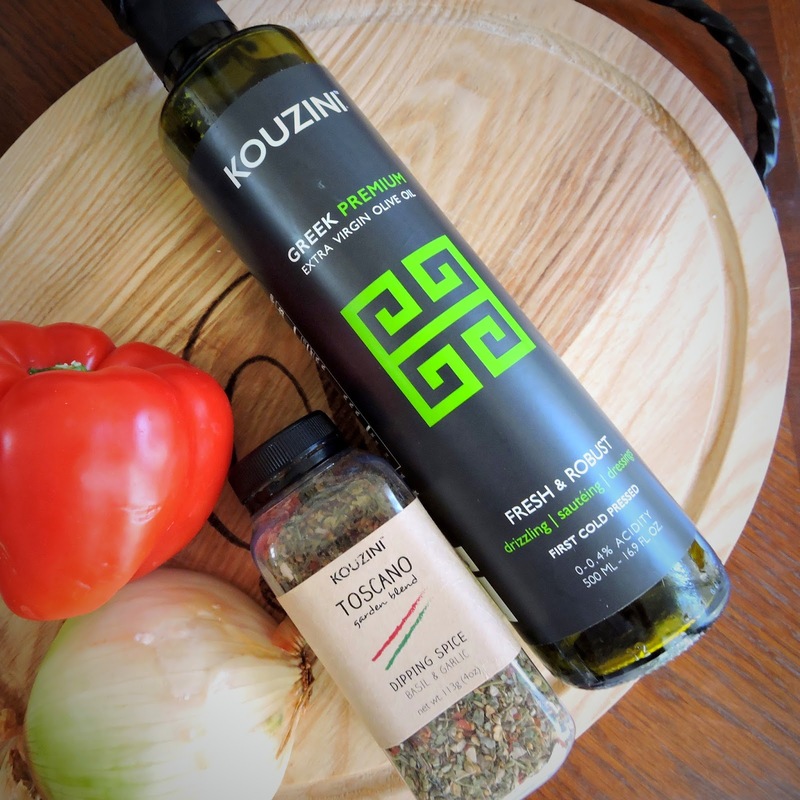 Italian food and cooking holds a special place in my heart, so the olive oils and spices from "Kouzini" were a welcome addition to my kitchen staples. I've been incorporating their products into my meals daily, as you may have already seen over on Instagram, and I have been nothing short of impressed. The quality of their olive oil is wonderful, and the spice blends have taken even my simplest of meals to the next level. I'll have a full product/brand overview post coming soon to fill you in on the products I've tried, but thought I would share this recipe first! Another update: I've also been tweaking my diet lately by tracking macronutrients and aiming for lower fat and higher carbs, while still trying to keep things Paleo (will list the macros for the recipe below!). It's a work in progress, but this dish was a nice break from the over-simplified food that I've been leaning towards lately. This recipe is also perfectly suited to satisfy a variety of diet modifications: use breast or thigh meat for lower or higher fat, serve over pasta if you're not gluten free, add spaghetti squash or zucchini noodles for higher carbs, or top with a little mozzarella or parmesan if you consume dairy. As always, I'm keeping life simple by using a jarred sauce ($2.99 organic sauce from Trader Joe's, with super clean ingredients!) and baking in the oven so I've got time to do clean-up while dinner cooks. Enjoy, and be sure to check out Trader Joe's for the sauce, and www.Kouzini.com for the spice blend & EVOO! You will not be disappointed! 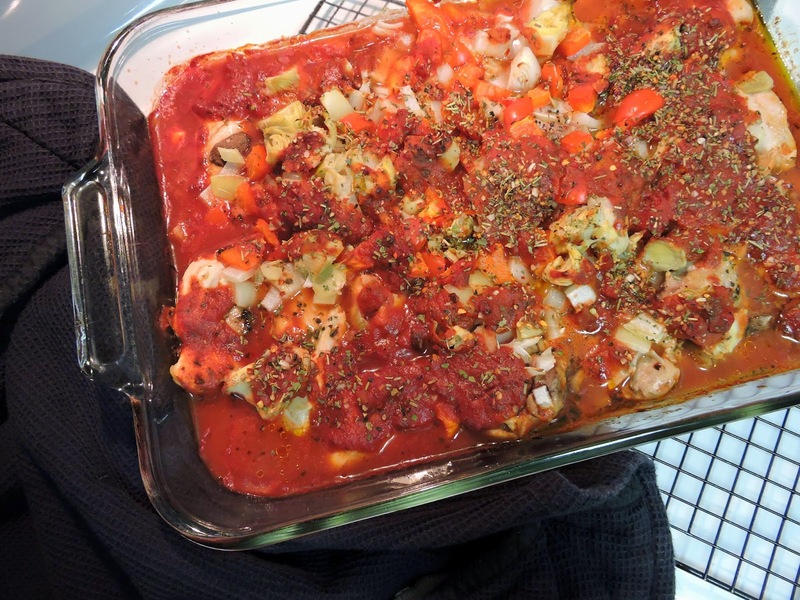 In a large glass baking dish, pour half the jar of tomato sauce & spread it out to coat the bottom. Heat the olive oil in a sauté pan over medium high heat. Make sure your pieces of chicken are patted dry, then place them in the pan to brown for 2-3 minutes on each side. Remove the chicken and transfer to the baking dish coated with sauce. Brown the chicken in batches if needed. 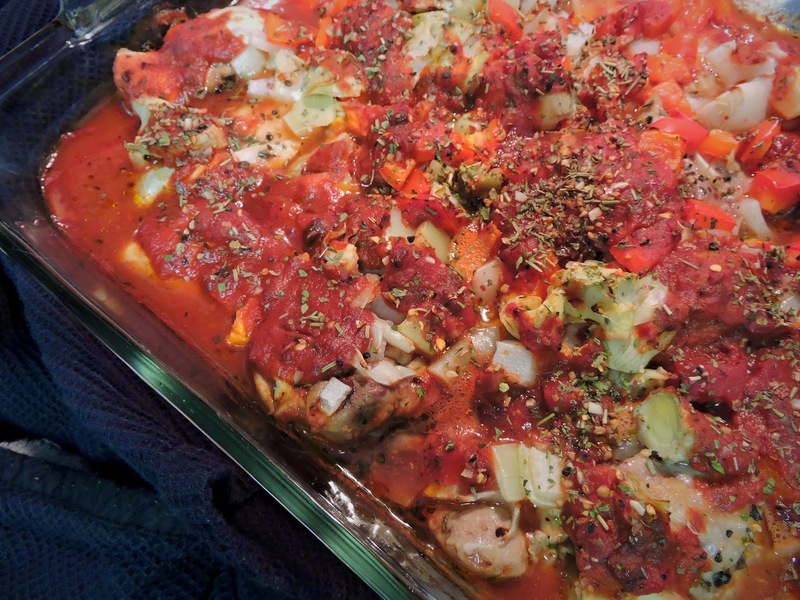 Spread the onion, bell pepper, mushrooms, and artichoke hearts evenly over top of the chicken, and top with the remaining half of tomato sauce. Sprinkle the spice blend over top of the sauce. Bake the dish, uncovered, for 30 minutes, or until the chicken is cooked through and vegetables are tender. Serve hot over fresh spinach, green beans, veggie noodles, pasta, or rice. *Macros are for chicken breast meat only. Picture is so gorgeous I can smell it! I don't think there's anything wrong with going low fat, so long as you don't go no fat... or don't dip below 15% of your calorie intake from fat. Then you risk not feeling satisfied, or ot getting enough fat for your body to process your other calories effectively. This recipe, by the way, looks great. Thanks for the inspiration. I love chicken recipe i will surely going to try his recipe at home, thanks for sharing this very unique recipe.